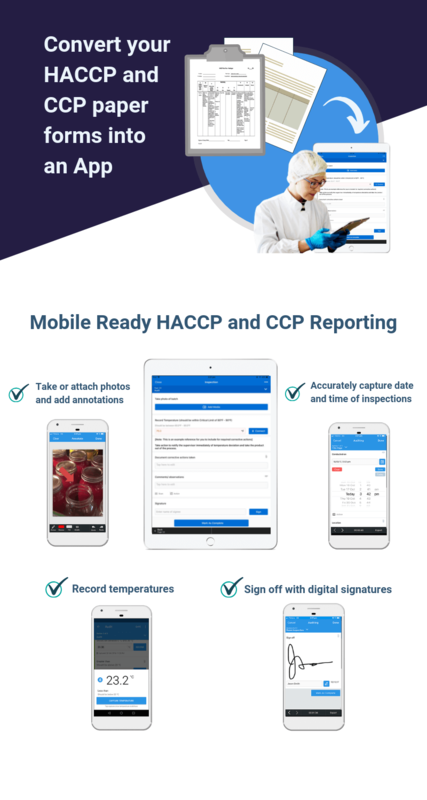 A HACCP plan is a food safety monitoring system that is used to identify and control biological, chemical, and physical hazards within the storage, transportation, use, preparation, and sale of perishable goods. It also determines critical control points (CCP) in the process of food production. Create a HACCP plan to mitigate risks of food contamination and avoid legal issues caused by foodborne illnesses. Learn how to implement a HACCP Plan in this article..
Good record keeping is one of the 7 HACCP Principles required in acquiring HACCP certification. Proper HACCP record keeping helps managers and business owners keep track of food production and handling processes and the corrective actions implemented. Document your HACCP plan as proof that your food manufacturing processes cover all possible food safety risks to ensure that finished products are safe and market-ready. ✔ Save all reports online. Preview a sample report here. Conclude the inspection with recommendations and generate a detailed on-the-spot report. Learn how to implement a HACCP Plan in this article. This CCP monitoring checklist is used by a person in charge (PIC) or chef to take a photo of finished products and capture temperatures as evidence of critical limits being met or not. This CCP monitoring template is used to assess a finished products pH to check if it meets the set critical limits. Take photo of product and indicate corrective actions taken in the event of critical limits not being met. This HACCP checklist follows the seven principles to maintain and manage the HACCP system. Use this HACCP template to evaluate if the HACCP team’s skills and experience are appropriate for the task. This checklist will inspect the products and check if the flow diagram to be used for each product is complete and verified. Moreover, the checklist also covers GMP, cleaning procedures, pest control, training, and calibration. Use iAuditor on your tablet or mobile device to conduct a digital inspection and generate on the spot report while on site. This HACCP Food Safety template helps to record potential food safety hazards which can be biological, chemical, or physical. Use this checklist to evaluate the CCPs, critical limits for each control measure, and frequency of the CCPs. Identify the corrective actions to be used and verify the activities performed. Use iAuditor to document data needed and generate an on-site report. Use this template to record all instances of corrective action being carried out whenever predetermined critical limits are not met. Record the details of the action taken and confirm if product is condemned. Identify the staff who found the deviation and the person who was informed of the deviation. HACCP Audit template can be used to identify the hazards, any CCPs, and the critical limit deviation. This template also records the past history of the product, corrective action, and future actions needed. Use iAuditor the best mobile inspection app to generate a comprehensive report and ensure risks are at safe levels. Use this HACCP Risk Assessment Template to evaluate food safety hazards and rate the risk rating. Identify the consequence, likelihood and risk rating of food safety hazards and identify relevant control measures. Use iAuditor to make sure that procedures are followed and corrective actions are properly addressed and assigned to appropriate team members.